I don't wear makeup everyday however when I am looking for something super fast that gives a little bit of coverage and adds some volume to my eyelashes this is what I tend to do! I only use 4 products. Concealer, eyebrow pencil, mascara and a lipstick. Firstly I apply concealer to my problem areas so around my chin and nose, I also add a little on my forehead then some concealer under my eyes! The one concealer I love and will always use is this Maybelline Fit Me Concealer in the shade 15 fair! This is $15 and can be found here! I then blend this in with the amazing IT Cosmetics Luxe Flat Top Buffing Brush! This is a ridiculously expensive face brush however it is so amazing and I love it!! It is $68 and can be bought here! I then fill in my eyebrows slightly with this IT Cosmetics Brow Power Super Skinny Eyebrow Pencil! This is a lovely, easy to use eyebrow product so it is perfect for everyday! I use the shade Universal Grey. It is $38 and can be found here! I then apply a quick subtle layer of mascara. Nothing to crazy just something to make the eyes look a little bigger and more awake! I use the Physicians Formula Jumbo Lash Mascara! This is my favourite mascara of all time! It is $25 and can be found here! Lastly I apply a swipe of lipstick! This is a very natural shade, I use this to moisturize my lips and add a little colour. I love this Napoleon Perdis DeVine Goddess Lipstick in SMP it is $38 and can be bought here! This blog post took longer to write then it usually takes for me to put all this makeup on, it is very simple yet looks like you have put in a little bit of effort. It also covers the areas on my skin that aren't so pretty! I hope you enjoyed reading about my everyday products! I would love to hear what you use on a daily basis! What are your favourite everyday products? Quick question: Do you prefer to read shorter posts like this? Or do you prefer more in-depth longer posts? Please tell me your thoughts. 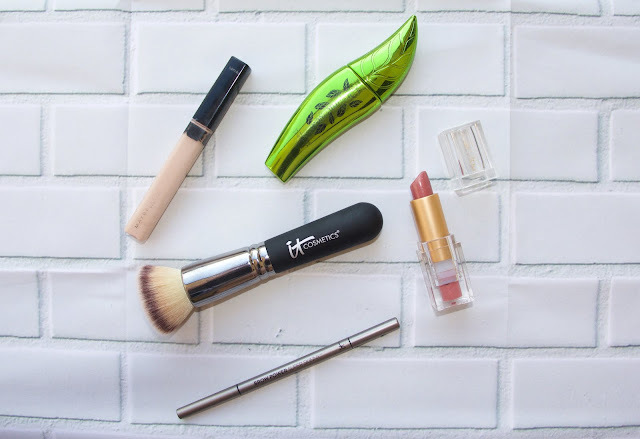 6 Products I Will Always Repurchase! Beechworth Honey Skin Care Range!